I hope last night you raised your glass to our wonderful neighbours who always seem to manage to make a mess of things when it looks like it should be so easy. I am of course talking of Tottenham's 1-1 draw with Blackpool at the Lane which meant that Gooners around the world could celebrate St Totteringham's Day. They'll be enjoying Thursday nights on Channel 5 next season eh! On to matters Arsenal and we're fighting today to ensure we finish in at least third place. Arsene Wenger wants the players to keep their focus and finish as high as possible so we don't have the task of returning to pre-season early and playing a Champions League qualifying round two weeks before the Premier League season starts. "Our next step is to be in the top three – we want to avoid having to play in July. "We have an advantage over City but only if we win our games. "We have not had to do it very often and we will cope if we do have to. But we will fight like mad to make sure we are in that top three." I guess we've yet to announce details of our pre-season tour yet is because it is dependent on whether we finish in the top three, thus avoiding the Champions League qualifier. Stoke have the cup final next weekend to think about but it still won't be an easy game. There is animosity between the fans, the managers don't get along and I doubt the players care that much for one another either. But we've got to be professional. Put in a display and prove we are worthy of a top three finish. There are nine points still to play for and baring a draw at Old Trafford along with a 22 man brawl and points deduction for each team, we need a miracle to finish in the top two. We can live in hope! Elsewhere, The Sunday Times has released it's annual Rich List and there are a number of people within the top 1,000 wealthiest people in the UK who have Arsenal connections. 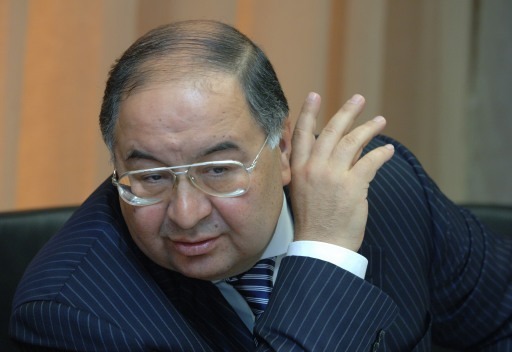 The clubs second biggest shareholder Usmanov comes in second, ahead of Roman Abramovich. The Uzbek is valued at £12.4 billion. David Dein joint on 968 with a personal worth of £70m; Lady Nina Bracewell Smith is joint on 518 with an estimated £135m fortune. The Fiszman family come in at 297 in the poll worth an estimated £248m. Board member Lord Harris of Peckham is worth £220m and comes in on the rich list at joint 315. Majority shareholder Stan Kroenke isn't listed. And according to the News of the World, Usmanov wants to meet with Kroenke to discuss how the American will take Arsenal forward. To be a fly on the wall if that meeting ever took place! There are a few transfer rumours doing the rounds as you'd expect for a Sunday. The Sunday Mirror say we're hot on the heels of 18-year-old Borussia Dortmund midfielder Mario Goetze. Might be a good player but do we really need another teenager? Isn't this squad crying out for a little bit of experience? One player with experience who looks certain to move on in the close season is Denilson. He's not featured in a matchday squad since being hauled off at half time in the draw with West Brom at the Hawthorns on March 19. The Sunday People have linked him with Sevilla, whilst they also report Roma are also interested. And whilst we are being linked with every left back under the sun, the Sunday People say we are keeping an eye on Southampton defender Luke Shaw. However he's only 16-years-old so not one for the first team next season! Very little else to talk about so I'll leave it there. Back with my prediction of the team a bit later.